So goes the old cliché ‘there are no easy teams at this stage’. But with the likes of PSG, Juventus, Leverkusen, last season’s bogey team – Basel, and the very tricky trip to Ukraine to face Shakhtar on offer for Chelsea in the knockout stages of the Champions League, the cliché was definitely relevant. And so it transpired that a repeat of last season’s thrilling quarter-final against the French champions would await Chelsea in the first knockout round. No sooner had Gianni Infantino – the Italian stallion of football draws – read out PSG and Chelsea together, the memories of Demba Ba’s last gasp winner at Stamford Bridge came galloping back into mind. Visions of Jose Mourinho charging down the touchline, arms aloft, were brought out of the top draw to stamp a gleeful grin upon the already smiling faces of the Chelsea fans. All things considered, the short trip to Paris was the perfect draw for Jose Mourinho and his men. It was by far the closest destination on offer. The away tie sandwiched by two home league games was the perfect outcome. Things would have been far more difficult had the long and arduous journey to Donetsk been thrust upon the team. In terms of quality, PSG pose the biggest test. But a winnable test. PSG are no pushovers. They are the French Champions, after all. And they proved in the group stages that they can mix with Europe’s biggest teams, beating Barcelona 3-2. But Chelsea – the manager, the players and the fans – know they can beat PSG. They did it last year through the very same grit and determination we’ve seen so many times at Stamford Bridge on a Champions League night over the years. That was with a weaker team. You sense that if Chelsea are to progress to the quarter-finals, it will be a different kind of victory. Everyone knows this Chelsea team is stronger than the one that faced PSG last season. It doesn’t take a genius to realise that leading the line is one of the world’s most dangerous strikers, even if he’s yet to open his Champions League account for The Blues. 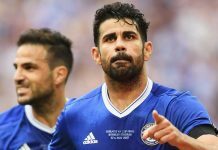 Diego Costa presents a completely different kind of threat to that of Andre Schurrle and Samuel Eto’o, who started the first and second legs respectively. That is, he presents a genuine, constant, unrelenting threat. At the heart of the PSG defence is the same pairing that was part of the Brazil side decimated by Germany at the World Cup; Thiago Silva and adding another bit of spice to this fixture, the £40m former Chelsea favourite, David Luiz. Prediction: Mourinho will tell Costa to wind up Luiz. Blanc will tell Luiz to wind up Costa. I wonder what the odds on one (or both) of those getting sent off are? Adored and the subject of huge frustration during his time at Stamford Bridge, you can almost guarantee there will be no middle ground for David Luiz, as there rarely is. He will either deliver one of his greatest ever performances, or crumble into another Brazil shaped disaster. A striker was the finishing touch everyone thought Chelsea needed last season. But last year there was no Nemanja Matic. The Serbian has established himself as an integral part of the Chelsea team – ineligible for last season’s Champions League after his January switch, the Serbian’s presence was sorely missed in the heart of the Chelsea midfield. His knack of dispossessing the opposition in the middle of the pitch is central not only to keeping quiet the advances of the opposition’s dangermen, but as a launchpad to release the likes of Hazard, Oscar, Willian and Costa. There is greater strength in his midfield partner too. Last season, Frank Lampard pulled out another typically Frank Lampard performance – stepping up on the big occasion. But, and I’ll get a lot of stick for this, Chelsea are in better shape with Cesc Fabregas than they were last season with Lampard. As a quick-passing, attractive footballing threat, Fabregas has taken Chelsea to whole new level. Lastly, Chelsea boast a hugely improved Eden Hazard. He is having a huge impact on games far more consistently than he ever has done in his career. But more importantly, it’s happening in the big games, as well. Don’t be surprised to see him brush aside the inevitable PSG transfer rumours with a spectacular performance. Paris Saint Germain are a huge threat to Chelsea’s hopes of the second Champions League trophy. Ibrahimovic, Cavani, Lavezzi, Pastore, Lucas Moura, Pastore – they are not to be taken lightly. But that’s just what Chelsea want. They thrive on the big occasion under the flood lights of a Champions League night with a European giant standing in their way. A test. But a winnable test.